CIYMS beat Instonians by 50 runs to win the NCU Senior Challenge Cup final for the first time at Comber on Saturday. 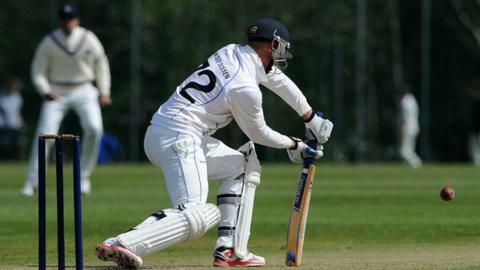 CIYMS made 259-7, with man-of-the-match Rassie van der Dussen top-scoring with 117, while Instonians were 195 all out. Their target had been adjusted to 245 from 46 overs under the Duckworth Lewis requirement after rain stopped play. The North West Cup final between Eglinton and Donemana has been rescheduled for next weekend after being abandoned on Saturday after rain. Donemana were struggling at 112-6 when the match was halted, Richard Kee having scored 30 and Ireland bowler Stuart Thompson having taken 3-19. The sides are trying to resolve the final at the second attempt after Friday's action was abandoned because of rain. CIYMS were frustrated on Friday after an unbeaten 134 from van der Dussen counted for nothing, but the same player stepped up to the mark again with his innings on Saturday. Van der Dussen's knock helped CIYMS post 237-3 from 41 overs in the initial encounter. That left Instonians chasing 167 from 21 overs under the Duckworth-Lewis format before play was brought to a close.